What a wonderful few years we had in showing with you fine people. For now, we will be putting the shows on hiatus until further notice. If you have any further questions, please contact James Blum or Matt Ulrich. Thank you for being a part of this fantastic family! We hope to see you at future shows. I am so glad to be back and working with everyone again! I needed that break to recharge! I'm hoping this year will be better than ever! That being said, check out our new Show name! Same location, Same great people! ​Can't wait to see you! ​I have enjoyed being your show secretary for these last 3 years. I have learned a lot and grown as an individual and a showman. For this, I am forever grateful. Over the last 6 months, my life has taken some turns that do not allow me to have as much freedom to do what is needed for the club such as the website, Facebook page, and show secretary. So for now, I will be taking a sabbatical indefinitely. I hope you consider me in the future if I am able to return. I will continue to be in the club and can't wait to see everyone at the show! It is a new year here in the Panhandle, and if you are like me, we are stir crazy! We're done with the holidays and we are thinking of the year ahead. We want to make new, fresh starts, and what better way to start your year than with chickens?! From husbandry to entertainment, here are 5 great reasons to have chickens in Pensacola. Fresh Eggs Taste Better than Store-Bought Eggs: Why? Having access to fresh grass, non-crowded environments, kitchen scraps, bugs, and sunlight lead to a great mixture of delicious, tasty eggs! Gardens Thrive with Chickens: Chickens don't only lay eggs, they also aerate the soil as they scratch around for bugs, they keep insect populations down, and provide great compost in their droppings. Once your garden is finished, set loose a small flock of chickens on it and watch them till up the weeds, kill bugs, and fertilize! Who wouldn't want their own personal gardeners? Chickens Provide Entertainment and Therapy: There is nothing more relaxing than sitting in a chair on a cool day with a warm sun and blue sky watching your chickens scratch about for bugs and treats. They have personalities all their own and many backyard poultry enthusiasts even name them like pets. These are just 5 of the multitude of reasons to have chickens. 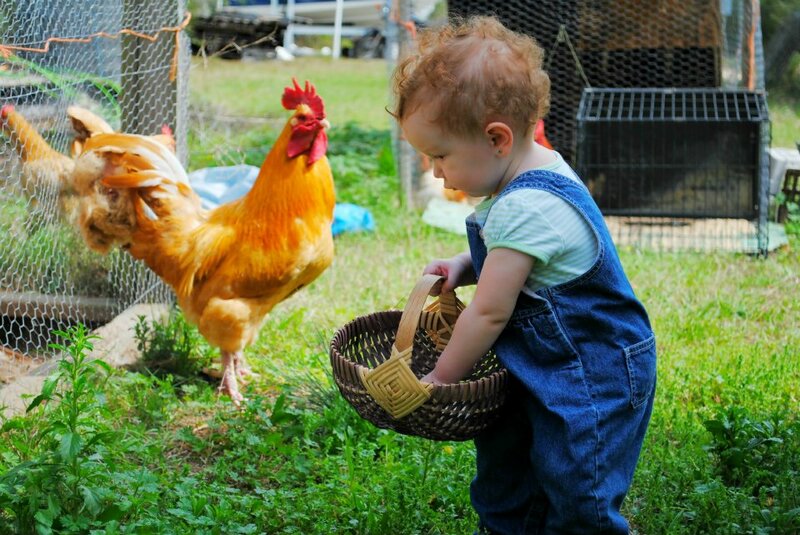 Not only are chickens a great first pet for kids, they are a great learning tool as well. ​They don't only provide fresh eggs, they help keep our lives enriched in many ways including activities in Poultry Shows and Poultry Clubs. ​Chicks are Easy to Care For: Unlike other baby animals, these come out ready to eat chick food and drink water which are great for kids to care for. They can easily be taught to drink from a small animal water bottle to help keep their water source clean. They need a dry, warm environment until they are fully feathered. Pine shavings in a Rubbermaid tote work really well. Chickens Love Kitchen Scraps: If you have left-overs, you can save some for the chickens and they will make you delicious eggs and compost! Don't overfeed them scraps however; everything in moderation! Please visit our Winter Show Page for more information. Our last meeting, we discussed the possibility of hosting a Spring Show again! This would probably be the 3rd weekend in March, but we're not set in stone yet. We have also changed our meeting dates since too many of you are in church on Wednesday evenings. We have updated our dates to every 2nd Tuesday of the month at the 4H building at the Escambia County office on Stefani Road. Same time 6:30pm. We are hoping to get another Informational meeting together. Possible topics are: Predator Proofing and Types of Housing for chickens. Interested in learning about incubation and how to bathe chickens?? Tomorrow, at 7pm, Doug Akers will be talking to the public about this and any questions you may have! 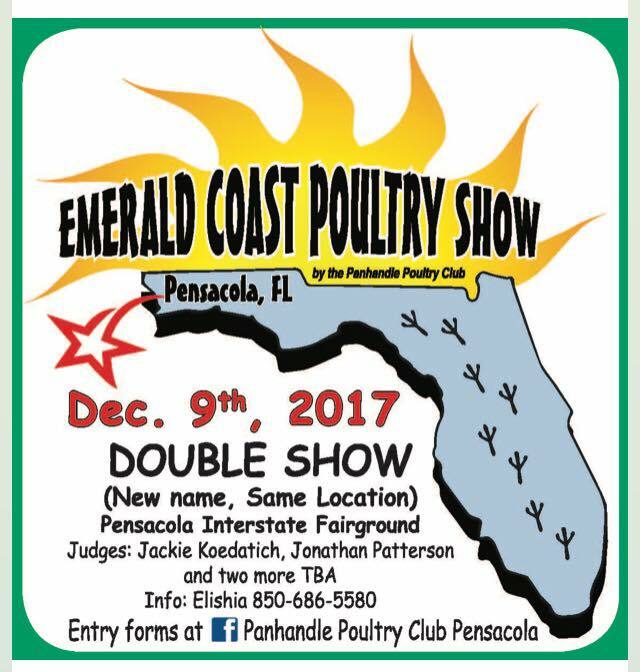 Sponsored by the Florida Panhandle 4-H Clubs. YETI Tundra 65 quart Raffle! Raffle tickets are on sale for $5 for a Yeti Tundra Cooler 65 quart, Desert Tan color! Contact us today to find ticket locations. Do not need to be present to win. Must be able to pick up in Pensacola, FL. Come learn about hatching chicks, raising chicks, and basic chick care. February 18th at 7:00 p.m.
We had a WONDERFUL show this year! It was our biggest yet, with over 800 birds! There will be a few changes to next year's show, including entry date cutoff being the 1st of December from now on. The Show Results are listed HERE.